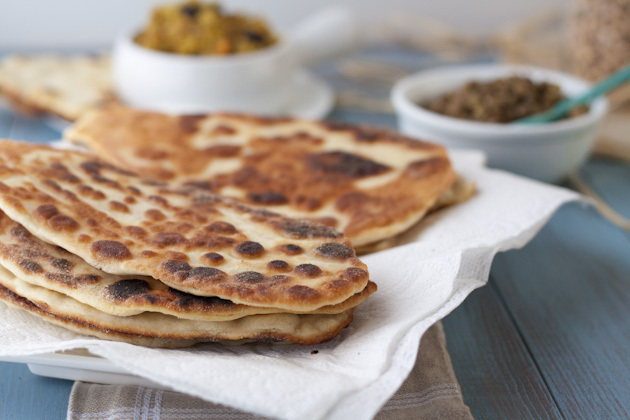 Enjoy authentic naan even if you’re gluten-free or dairy-free. Combine dry ingredients in bowl of food processor with dough blade until combined. Remove the lid to the processor and add all wet ingredients but the water. Blend until combined. Continue to keep the machine running and add water slowly. Once it’s all added, allow to run for 3 minutes. If mixture is not pulling away from the sides of the bowl at the 3 minute mark, add additional white rice flour until it does, about 1 tablespoon at a time. My naan was perfect at 1.5 tablespoon added. If you’re not sure what consistency is perfect, remove the lid of the processor and poke your finger in the dough. If the dough sticks to your finger, it needs more flour. It it doesn’t stick, you’re good! Flour a clean surface with a bit of white rice flour. Remove the dough from the bowl and form into a ball. Place in a bowl, cover with a clean kitchen cloth and allow to sit in a warm place for 40 minutes. I like to place it on top of my oven after I’ve baked something. It’s a perfect spot! Once 40 minutes has passed, check on the dough. It should have increase in size by about 40%. In the bowl, cut the dough ball into 8 sections like a pie and cover with the cloth to keep from drying out. Heat a large cast iron skillet on medium-high heat for at least 5 minutes. 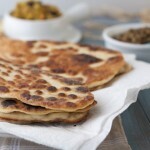 When heated and about to place naan on the pan, drop 1 teaspoon ghee or coconut oil and allow to melt. Meanwhile, flour a silicon mat with a bit of brown rice flour. Place 1 section of the dough (you may find that the cuts in the dough have almost disappeared, this was just to give you an idea of the size of the dough to use for each naan, don’t worry about it too much) on the mat, and kneed for a couple of seconds. Roll into a rough ball and place plastic wrap over top. Roll out to about 1/4-inch thick in an oval-like shape. Flip the silicon baking mat over so that it’s on top and peel the dough away from the baking mat so it’s left on the plastic wrap. Then, flip the dough on to your free hand and peel off the plastic wrap. You should now have a naan in one of your hands. Place it in the hot pan. Allow to cook about 1.5 minutes, until bubbles form and the bottom is golden. Flip over with a spatula and allow to cook for another 30 seconds. The trick here is to not overcook it on this second side. It should be slightly undercooked as it will continue cooking while it cools. I know this sounds ludicrous, but trust me! Place on a cloth or cooling rack and repeat another 7 times with the remaining dough, oiling the pan with 1 teaspoon ghee or coconut oil each time. If you do not oil, it will not work well. Serve immediately, or allow to cool completely and wrap in paper towel and store in an airtight container either in the fridge (will keep for 3-5 days) or freezer. When ready to eat, microwave pieces in the bag or container for 45 seconds each. If you do not have a microwave, or wish not to use it, you can steam the bread for 15 seconds.